For other uses, see Mannimarco. 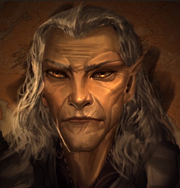 Lord Mannimarco is an Altmer Necromancer in The Elder Scrolls Online. He is Molag Bal’s main agent on Tamriel. Mannimarco is working with the Chancellor of the Elder Council, Abnur Tharn, to merge the world of Nirn with Molag Bal’s plane of Oblivion, Coldharbour.